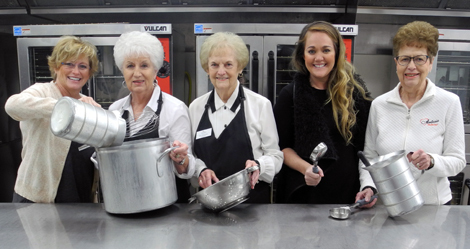 Altrusa members, from left, Paula Menefee, Ruth Bratcher, Mary Hendrickson, Jessie Berry and Jeannine Null are preparing for the 53rd Annual Altrusa Smorgasbord, scheduled for 11 a.m. – 1:30 p.m. Sunday, Jan. 31, in the Park Junior High School cafeteria. Tickets are $12 for adults, $6 for children under 12, and dine-in or carry-out options are available. This year’s menu includes turkey and roast beef, rice and cornbread dressing, mashed potatoes and gravy, green beans, rolls, Swedish slaw, salads, and various desserts. Tickets may be purchased from any Altrusa member or at Brown Drug, 322 W. Washington Ave.